Friday, October 5th, 7-9 PM at The Book Cellar in Chicago for THE ANIMAL IN MAN LAUNCH EVENT!!! What better way to celebrate this announcement than with some new character concept art? Fresh from the digital canvas of the super-talented Nic Morales, may I introduce you to Zariel, also called “Old Four Swords,” and I think you can easily see why. 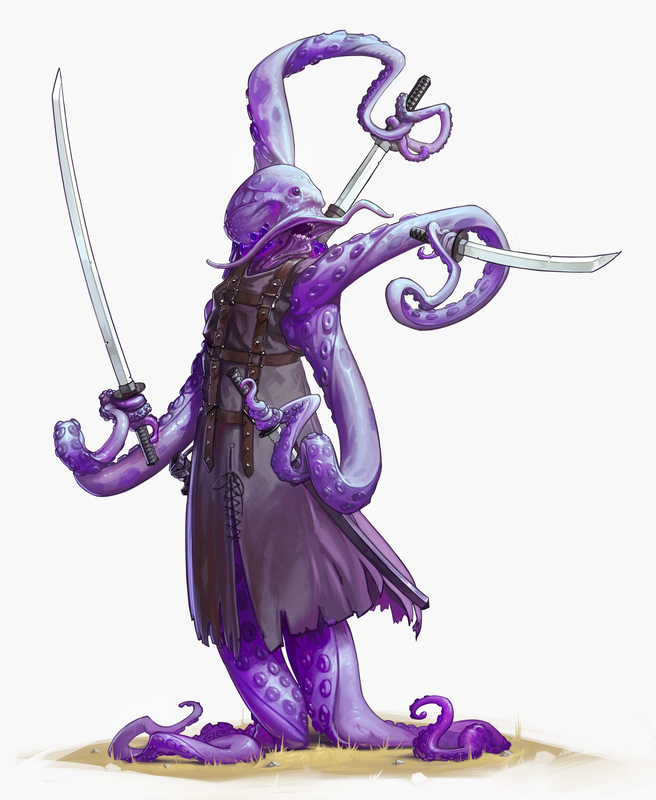 Zariel is a genetically engineered octopus, hailing from Peskora, the tropical archipelagian nation far to the west where vast numbers of aquatic species dwell. Each of the four swords he wields are a technological marvel, capable of cutting any material clean in half, no matter its molecular composition. There is, in fact, a moment or two in The Animal in Man Part Two: Ferocious Heart when the lone octopus literally brings about the collapse of a tower. Do you like this art? Did you like Nic’s previous concept for Saghan? Would you like a chance to have a signed poster of this thing hanging up in your office? From now until October 5th, all you have to do is make an order of The Animal in Man: Violent Mind or show up for the launch event at The Book Cellar to enter in person for a chance to win these! Find me (and the event) on facebook, Follow me on Twitter, Follow both The Animal in Man Part One and Two on Inkshares!